What’s an indecisive foodie to do when visiting a new city? Happy hour hop! Follow me on a romp through some of Vancouver’s best happy hour spots, where locals, business travelers, and tourists alike can sample some of Vancouver’s great dishes, cocktails, beers, and wine – all while sticking to a budget. My first trip to Vancouver was far too short, and thus choosing restaurants – let alone neighborhoods – was tough. 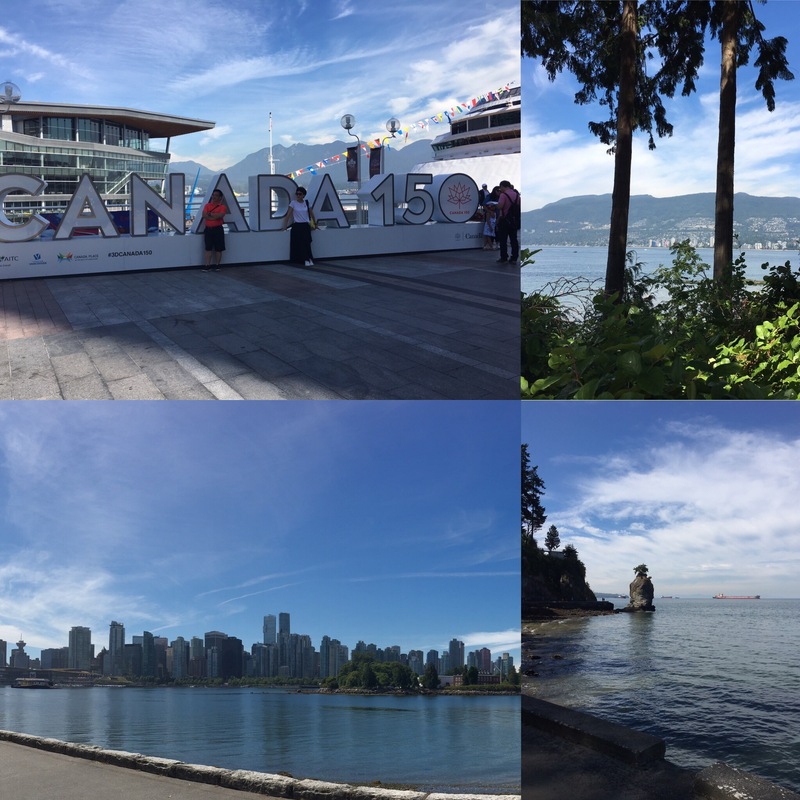 I spent quite a bit of time exploring the city on foot, including a wonderful run around the shoreline perimeter of Stanley Park. During those explorations, I couldn’t help but notice just how many restaurants prominently advertised their happy hour specials with sidewalk signs. I also couldn’t help but notice how inexpensive the specials seemed to be. Thus a plan was hatched. Most happy hours begin at 3 or 4 pm (1500-1600), but many high-end restaurants take “happy hour” literally with a one-hour happy hour from 5 to 6 pm (1700-1800) and nearly all end at 6 pm. I started my afternoon with Rogue Kitchen and Wetbar, whose prime location at Vancouver’s central rail station and all-day operating hours allow an early start to its happy hour of 3 pm. Rogue has large indoor and outdoor spaces, and their happy hour specials apply regardless of seating, so I dined on the outdoor patio on this warm summer day. I chose the Dirty Laundry Gewurtztraminer from British Columbia’s primary wine producing region, the Okanagan Valley, paired with a vegetarian, non-dairy cauliflower taco, which was highly recommended on Yelp and Trip Advisor. 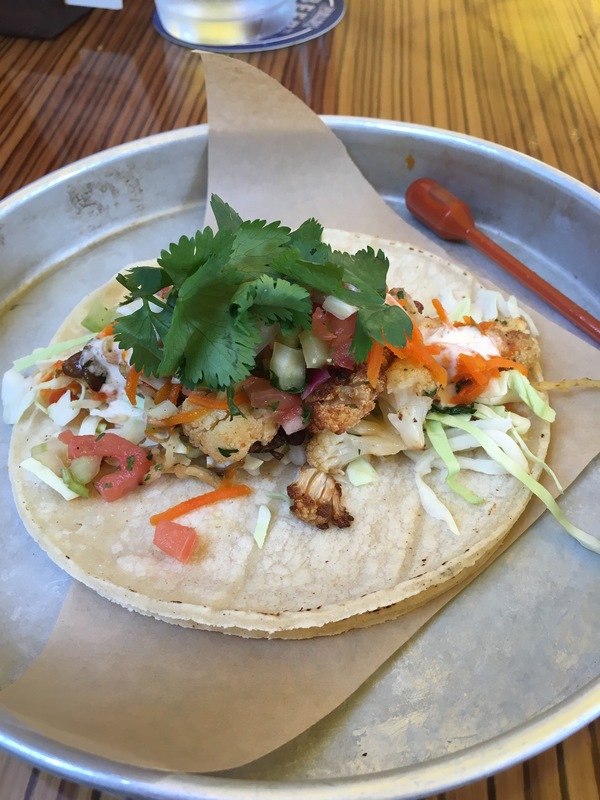 The taco wasn’t extraordinary, but it was a pleasant sweet-spicy-savory bite and decently priced. The wine had powerful floral notes and a boldness more typical of New World wines as opposed to the delicate aromas of Gewurtztraminers from Alsace, the German-French wine region known for its Gewurtz. I next moved on to Vancouver’s historic Gastown neighborhood, which has a bit of an East Coast vibe and a significant tourist vibe. I chose The Flying Pig, a local brasserie sort of establishment with three Vancouver locations, as it is a favorite of locals and tourists alike. Its happy hour runs from 4 to 6 pm. They are known for their pulled pork poutine, but I opted for “standard” poutine on the bar menu, paired with a bold Merlot and Cabernet blend from 49 North in the Okanagan Valley. The winery is named for its latitude, the 49th parallel north. On the fringes of the prime latitudes for wine production – grapes thrive best between 30 and 50 degrees (North or South) – I was pleasantly surprised by the highly ripe red fruit characteristics in this red, as whites tend to fare better at high latitudes. It was a nice match for the heavy richness of the poutine. A brief word about poutine for my non-Canadian readers. Poutine is one of Canada’s signature national dishes. It is not for the faint – or literally weak – of heart, as it is your arteries’ worst nightmare. I’ve seen it make inroads in the US in the past 5 years, but many, including my own father, had never heard of it. So allow me to enlighten you, if you’ve not already made a frenemy out of poutine. Poutine consists of French fries/pomme frites smothered in gravy – often poultry gravy; the best comes from duck fat – and then covered with cheese curds. 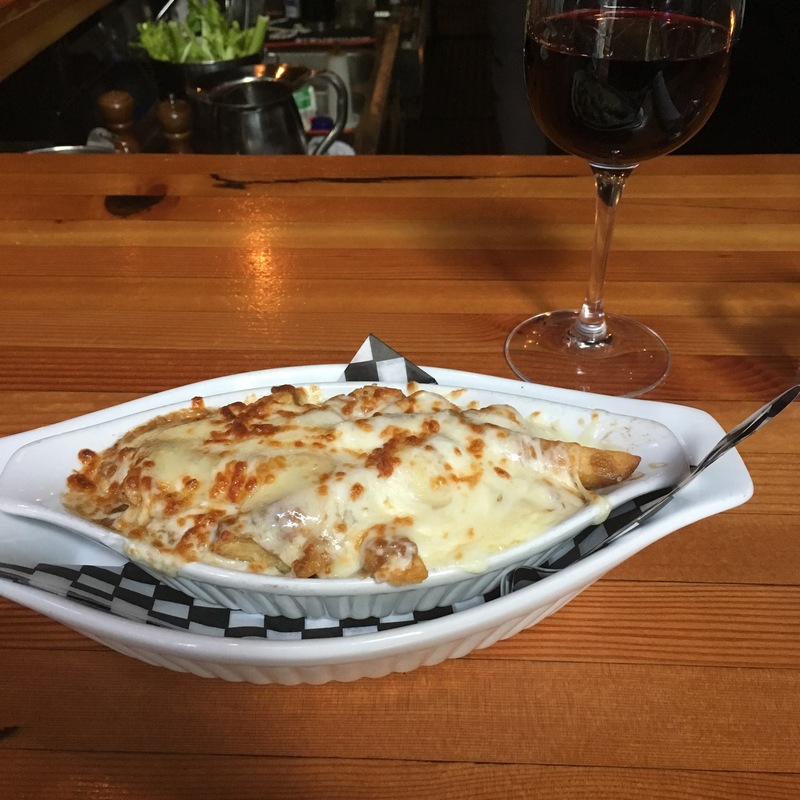 Now, looking at this photograph, at first glance, you might assume it to be lasagna or cannelloni, but The Flying Pig’s poutine is coated with a layer of solid, broiled cheese. While I would have liked to experience cheese curds rather than a cheese layer, it was sinfully delicious, made even better by the wine. I stopped myself at half a portion, as nobody should attempt to eat the entire serving themselves. And it was time to move on once more! 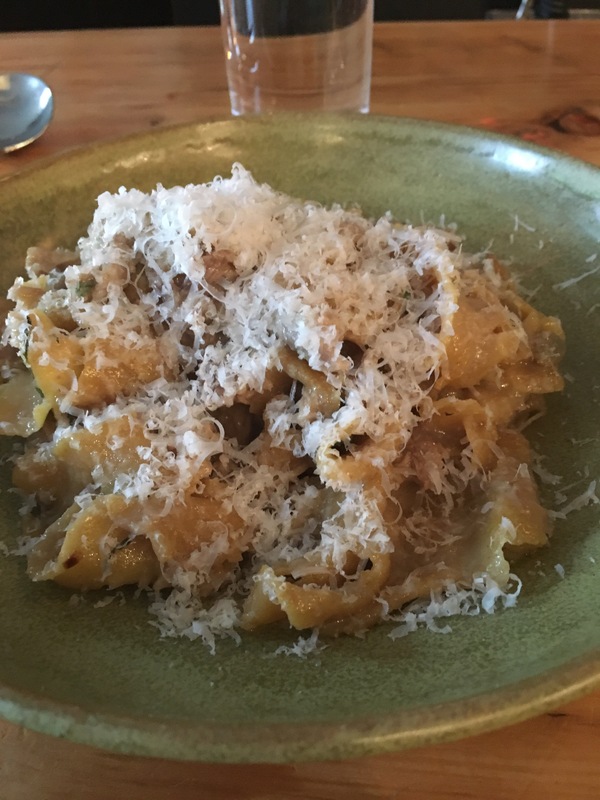 My final happy hour hop stop was, admittedly, a substitute for the one restaurant I’d wanted to visit in Vancouver before I arrived, The Oakwood, but its location outside the central downtown peninsula made dinner logistically difficult. Gastown’s Wildebeest, however, was a more than adequate substitute. Wildebeest is a meat-centered gastropub. It wins rave reviews for its creative small plates – and for the chef’s selection, should you come with a group of friends or family willing to share. Such plates include bison carpaccio, bone marrow, and even horse tartare! Wildebeest has a short happy hour from 5 to 6 pm with reduced prices on small bites, such as its shaved foie gras, house wines, and cocktails. I went for the house red – which changes regularly; on this day, it was a fantastic Pinot noir from BC’s Okanagan Valley (I sound like the proverbial broken record here). With it, I tried the shaved foie gras snack. 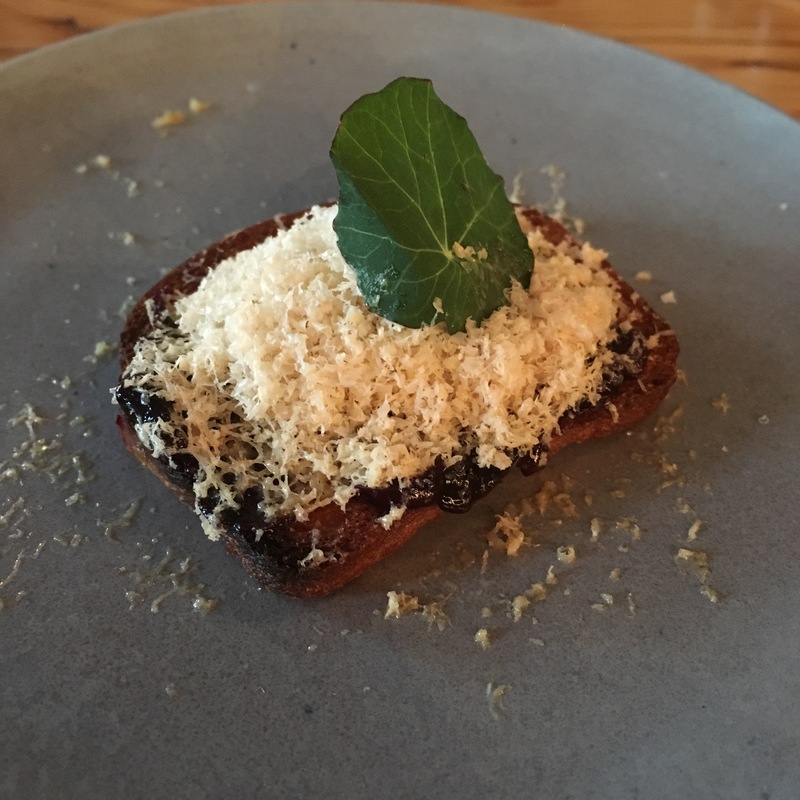 And snack it was: a crisp brioche toast (bit like Melba toast), topped with a blueberry compote, the thinnest mandoline-sliced bit of foie gras terrine, and Parmesan cheese. Unfortunately, I could barely taste the umami goodness of the foie gras, instead getting mostly the toast and compote. Oh well! I had much better luck with my main course, the duck papardelle with pulled duck ragú. It had been overwhelmingly recommended by TripAdvisor reviewers and for good reason. The duck ragú featured generous portions of pulled duck breast. Together with the Okanagan Pinot noir, it was a fantastic meal. The one problem with three (solo) happy hour stops is the full belly. I suppose, at least, that it balanced the three heavy pours of wine at each stop. I would recommend a stop at any of these three establishments for happy hour or a full meal, and I look forward to making more inroads into Vancouver’s culinary and happy hour scene on my next trip.